Get Freekeh! What is Freekeh (pronounced freak-uh)? I am delighted that you asked. The story goes that freekeh was created by accident nearly 2,000 years ago when a Middle Eastern village was attacked and the crop of young green wheat was set ablaze. Rather than sulking over the misfortune, the crafty villagers rubbed off the wheat chaff and cooked it, exclaiming "Eureka!" Freekeh was born. Today, freekeh is used in Northern Africa and the Middle East, and has recently ventured into Western food culture. Freekeh goes through a roasting process in its production creating a nutty, slightly smoky flavor. After the wheat is roasted, the grain is threshed or rubbed, giving this food its Arabic name "farik" meaning "to rub." Similar to the taste of barley, freekeh is an excellent source of fiber, plant-based protein, and nutrients. 1/4 cup freekeh equals 6 grams protein, 20% Iron, 8% Zinc, 10% Folate, and 80% Manganese. This Beet, Apple, and Walnut Salad with Freekeh offers an inviting medley of flavors. 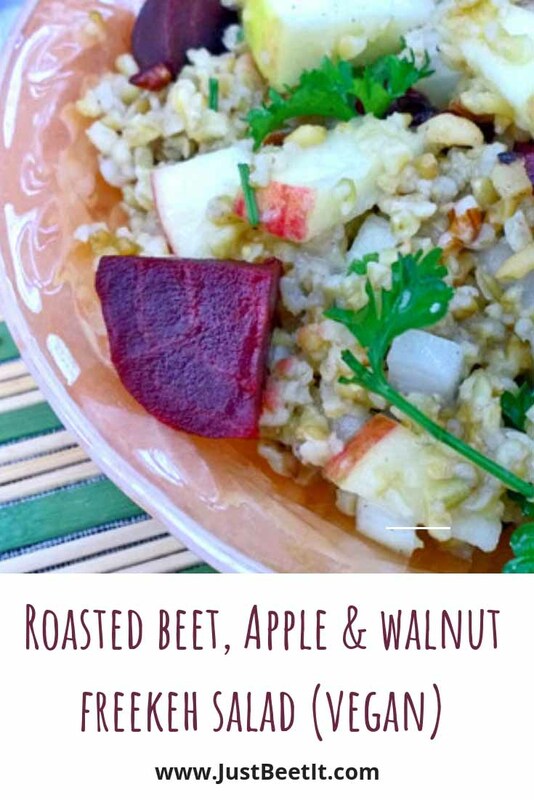 The sweet, earthy beets compliment the nutty flavor of freekeh, while the apples, walnuts, and parsley add crunch, texture, and taste. Plus -my mom loves this salad (and she is not the biggest beet enthusiast)! Do you cook with freekeh? I would love to hear your experiences. *Organic Freekeh Roasted Green Wheat (Freekeh Foods): Freekeh is a wheat product and contains a small amount of gluten. This grain is not suitable for people with celiac disease or gluten intolerances. 1. Empty 1 cup freekeh In 2 1/2 cups water or broth in a saucepan and bring to a boil. Cover, reduce heat, and simmer 20-25 minutes or until desired tenderness is reached. 2. Remove from heat, let stand for about 5 minutes, and fluff freekeh. 3. Add apples, apple juice, lemon juice, and orange zest. Let stand for about 10 minutes. 4. Add onion, walnuts, parsley, and chives and toss. 5. Add chopped beets, a dash of olive oil (optional), salt and pepper.